With the campaign to defeat independence not due to be launched formally until next Monday, the independence campaign could have used this time to its advantage. It’s roughly a month since Alex Salmond launched the Yes to Independence campaign in Edinburgh, with a pledge that a million Scots would sign a pledge supporting the efforts to see Scotland an independent nation. With the campaign to defeat independence not due to be launched formally until next Monday, Salmond et al should have had free reign over the past four weeks to build that treasured possession in politics, namely momentum. Instead, we have witnessed what could possibly be the start of a new omnishambles with the campaign lurching from one problem to another, with splits across the movement. Firstly, just days after the campaign launch, Yes Scotland was forced to make changes to its website, after it emerged that those who were merely following the campaign’s twitter feed were being listed as full blown supporters. This was followed soon after by the sight and sound of Scottish Green co-convenor Patrick Harvie deciding to withdraw his party from the formal Yes campaign in protest at how dominated it had all become by the first minister to the determinant of other voices. 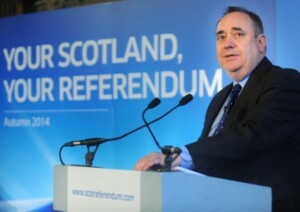 Yesterday came the news that, and I kid you not, on the advice of someone called Claire Howell, a psychology consultant who is apparently a long-standing adviser to the SNP, Alex Salmond has urged his MSPs to stop using the term “independence” and instead speak of an “independent Scotland”, which is apparently more appealing to the voters. And today comes the bizarre news that the SNP MP Angus Robertson, Campaign Director of “Yes Scotland”, has used an interview with the German magazine Weiner Zeitung to claim that he is not in fact a nationalist. And the results of all this? One look at the Times this morning will make grim reading for the nationalists, with polling results compiled by Ipsos Mori for the paper showing (£) that 35% said they would support independence, down 4% since January when the very same question was asked. Those favouring the status quo stood at 55%, 5% up during the same period. What is more, although 53% of respondents said that they were still “satisfied” with the first minister, this remains 5% down from January with the level of dissatisfaction with the job Mr Salmond is doing having risen from 36% to 40% now. Whilst the Yes campaign has sought to dismiss the findings as just one of many which have shown different things, they will be acutely aware of Scottish Labour’s assertion that the more the people of Scotland hear about independence the less they like it. “This poll reinforces the task ahead for the ‘Yes’ to independence campaign. Despite a high profile launch of their campaign, the public appears unconvinced as yet and support for independence has fallen. The difficulty faced by the campaign is reinforced by the fall in the personal approval rating for the first minister. 1. Perhaps the English should get a vote on whether Scotland should have independence. Oh the nightmare of England saying yes, and Scotland no. Imagine the chip on the shoulder then. 2. Perhaps the Scots should be asked if they still want devolution. and NO complaining afterwards, whichever option you choose. I’d prefer England to have a vote on whether England should have independence. It’s up to the Scottish to say whether they want to leave the UK not the English. Equally it’s up to us English to say whether we wish to leave the UK. Reality is catching up with Mr Salmond. Get this thru your thick English skull!, it’s a Scottish referendum, not English or any of the other’s associated with the four nations of Britain! Away and have your wee vote, indeed raise an epetition, have an independent England, you’l feel better for it but stop thinking Scots will not vote for Independence!, it is not a call of Braveheart!, it is a natural progression, and the Scots do want their Freedom back! You are not representative of the majority of Scots. I am Scottish and will vote ‘NO’ and I have yet to speak to even a handful of people who will vote the other way. Your intemperate comment seems to show the frustration you feel at seeing your regressive dream dying. Also it is just a little more of that ‘progressive’ mask slipping down to show the true face of nationalism. I suggest you crawl back under the negative rock you wriggled free from and leave those of us who believe in co-operation to get on with making all the nations of the UK fairer and more progressive places to live without the shadow of xenophobia hanging over us. If those were the options then hardly anyone would vote. Most people in Scotland believe Devolution is the best way forward for the country. I believe devolution would also benefit England but it’s not up to anyone but the English to deliver devolution (whether for England or by regions of England). It should be borne in mind that Angus Robertson is a German Scot, formerly employed by Austrian Radio, and was interviewed in German within a German-language cultural context. Within that context there is a particular need for a distinction to be drawn between nationalism as understood in the German-speaking world and civic nationalism as it is understood in Scotland. Mr Robertson is highly qualified to do draw that distinction. sometimes give rise to, not least in other languages and in other cultures. The anglo-media, on the other hand, can be relied upon, as usual, to traduce rather than to clarify. Taking perfectly reasonable statements out of context and distorting them is becoming representative of the nature of the anglo-unionist campaign and is already disreputably representative of the media in England, of course, which are not what they once were, as we should all be acutely aware by now. There is nothing new in independentists expressing the view that the very loose and widely misconstrued term ‘nationalist’, which has numerous connotations and denotations, is not one which on its own can be entirely relied upon in all circumstances to convey adequately the essential nature of their political convictions. As Mr Robertson makes clear, Scottish independentists, unlike many British nationalists, are cosmopolitan rather than insular and pro-European rather than anti-European. Incidentally, Wiener Zeitung (not “Weiner Zeitung”), is not, as its name makes clear, a “German magazine” but is an Austrian newspaper published in Vienna. The ‘Anschluss’ didn’t take! Not unlike the anglo-union in a way. Your own comment is somewhat intemperate, I venture to suggest. I wasn’t criticising that aspect of his comment, merely suggesting the cause of it’s tone. I guess I don’t like people calling others stupid just because of hwere they come from. Call me stupid and I’ll take it but don’t criticise me as a Scottish idiot. Why has the nationality of the person Wallace1297 disagrees with got anything to do with it? Is it because the nationalist face behind the slipping progressive mask? No gerard, my comment was aimed at lord blagger!. He continually spouts about how it would be funny if England had a vote on Scots independence and it was England that voted yes and the Scots no, how funny that would be? He also spouts on about how the Scots have big chips on their shoulders, when he has no clue as to what has been done to Scotlands Industrial base over the last half century to help out English based industry! That also appears to be your problem as well, unless that is, your in your early twenty’s, which suggests then that you have no clue as to what your on about!! Stronger together, fairer UK?, co-operation?, would that be the same fairness and co-operation that has seen the industrial base in Scotland hamstrung by Wastemidden? Nationalism?, there is nothing wrong in having pride in your country of birth, go ask the Germans, the French, English, etc, etc, if either of those nations feel any pride towards their country, then ask them the question do you feel like a nationalist, bet the answers yes but pose the question in Scotland and if you are you are xenophobic?, away pap peas at the moon nugget! Co-operation is it, mmm, you mean the type of co-operation that is currently screwing the planet up for profit while the indigenous people are cast off as second class citizens? Go ask the polish how solidarity worked out for them! You are not representative of many views in Scotland, and if you think your views are, you better think again! I suggest you crawl back under the rock you so obviously have come out from, have a wee think to yourself, look around that rock you came from and think to yourself, could this be better if we were not being drained by the leech that is wastemidden!! I have no problems with some ones nationality, i do however call a spade a spade!. Lord Blagger professes to be English, therefore using the phrase “thick English skull”, is not me having a go at his nationality but rather his rationality! Maybe your one of those PC Fascists eh?, oh don’t use language that is not in the PC Brigade hand book!, it’s offensive to my delicate little mind!! In any case, i always find that if the question or answer does not pertain to you leave it alone, it’s not your business!! If social democracy is going to succeed in countering the neo-barbarism of neo-liberalism, then the Left in EWNI are going to have to so a bit more sophisticated thinking than blindly opposing the SNP and Scotland’s return to self government in order to prop up Labour in Scotland and hope to win at the next GE. Sometimes the ‘obvious’ thing to do is the wrong method to achieve goals. In this case the ‘obvious’ thing to do is to assume that the SNP is ‘the enemy’ because it is opposed by Labour in Scotland. This also assumes that opposing a national movement for self determination is a) morally justifiable, b) not a hopeless lost cause c) somehow supportive of Left ideals. There are such things as global historical trends, since WWII all the sizeable bits of the British Empire have become fully self governing. The UN has increased by over 120 newly self governing countries. Scotland is simply another. With the growth of international shared organisations, UN, EU etc, has come a matching trend for people wanting a direct say in such forums. The world is a much better educated place than 50 years ago. With education comes the demand for more local say and democracy. This led to the Scottish Parliament and is now leading to demand for more powers and control by the Parliament. International agreements and Unions have their purpose, meet needs for a given time and then fall into disuse or get scrapped. The defence, trade and other reasons for the Union (such as preserving the Protestant religion) are now simply badly outdated. Why get so wired up in defence of an outdated arrangement. To return to the theme of this post, the Left needs to think more long term, and more strategically. Despite the coalition unpopularity, Tory incompetence, etc, Left thinking is on the back foot at present in EWNI. In order to get in on the front foot, needs there is a massive need for strategic repositioning. Signing up to back the arch-Unionist Tories is definitely NOT going to positively reposition the Left. What I advocate, is that the Left takes a ‘long shortcut’. Back off the trap of being ultra-Unionists. There are no prizes or winners in that route. Instead, watch, study, adapt and adopt the best of the pioneering methods being used in Scotland. Translate and interpret those social democratic policies for English needs and wants. In three years time, Scotland will dissolve the Union. Given the current head in sand posture of most politicians, the establishment will be in disarray. This presents the opportunity for success for the Left. If they have spent the intervening time and energy demonising and dismissing the best social democratic movement in Britain, the Left will be as unprepared as the others. If the Left has disengaged, observed, deliberated and prepared, then the Left can present clear, coherent, cogent arguments as to how the constitution and government of EWNI must be reorganised. The ‘long shortcut’ is the quick route to reform. Let Scotland reform itself its way. Get prepared to reform EWNI when the once in generations opportunity opens up.